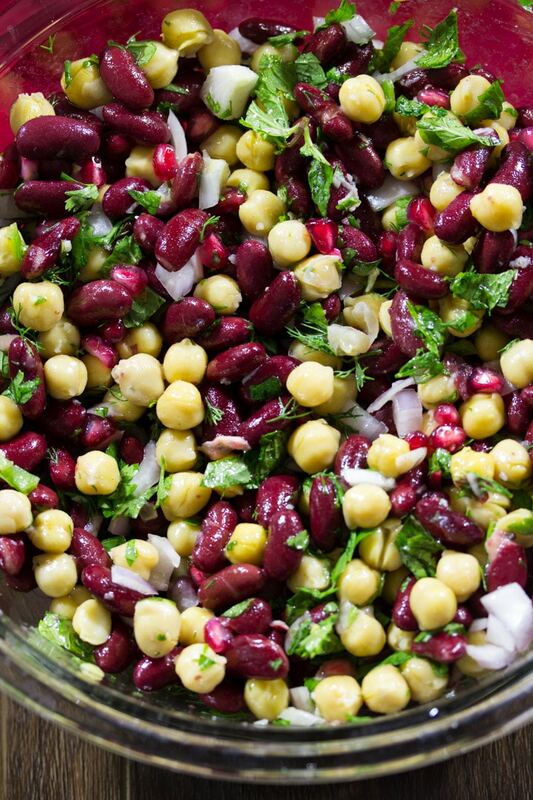 Say hello to this gorgeous Chickpea Pomegranate Salad, because it’s about to become your companion for long sunny summer days! Have you ever had leafy, green salads that look gorgeous but basically don’t taste like much and make you feel a little bit sad? Anyway, this salad is not that kind of a salad. This salad is so good, that you’ll want to eat it all the time. Also, it fills you up really well, and those little juicy pops of pomegranate? OMG, SO good!!! 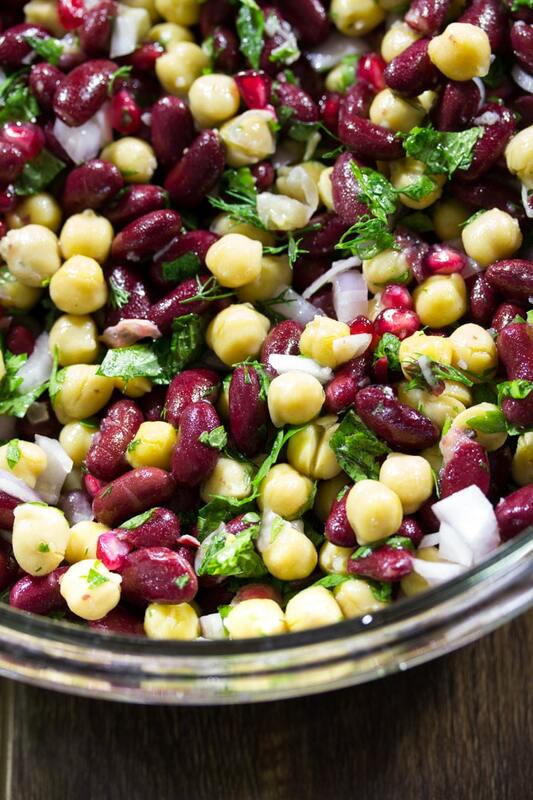 So here comes the point where I talk about all the lovely flavors going on in this Chickpea Pomegranate Salad. 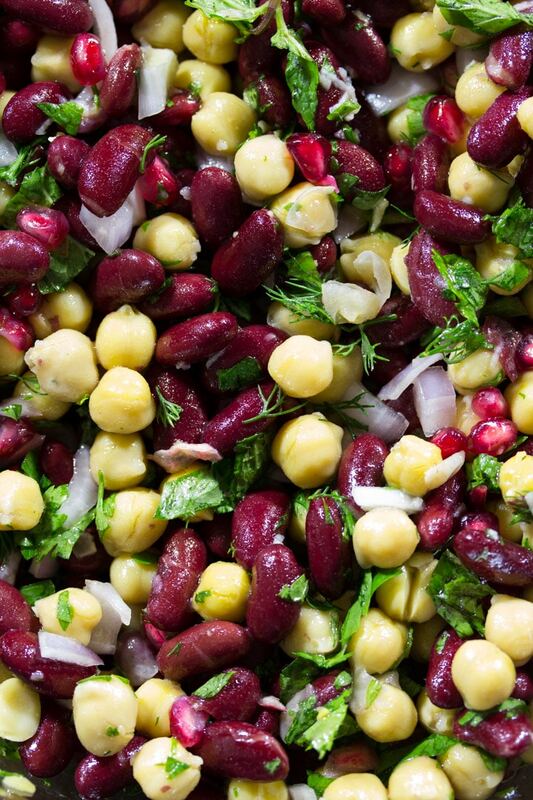 Basically, this Chickpea Pomegranate salad is both healthy and delicious. Also, super fast, obviously (as are most recipes on my blog because this busy mommy has no time to waste in the kitchen). Let’s talk about the flavors in this salad. The beans taste nice,creamy and salty (blah, blah…I mean how do you explain the taste of beans?). And basically fill you up with lots of good stuff…like protein? Dunno, just Google the nutrition facts, okay? Lol. The herbs are nice and add lots of freshness to the salad. So even if your baby has kept you up at all sorts of weird hours during the night, this salad will help you feel fresh. Okay, just kidding, nothing will make you feel fresh after staying up with a baby…except maybe a jug of coffee? But this salad is perfect for those days when you’re just sick of takeout pizza (is that even possible? okay maybe) and want to feel like a health guru or something. And lastly, let’s talk about those pomegranate seeds. I mean, why have I waited so long to add them to salads? All these years, I’ve been eating salads without pomegranates. That’s such a travesty (drama queen?!). Okay, I’ve run out of things to say (write) now. So mix it all up, and EAT this salad all summer long. You won’t regret it. 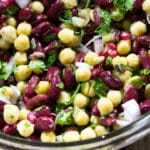 This Chickpea Pomegranate Salad is filled packed full of fresh flavors with lots of herbs and is super easy to make. Perfect for the long summer days! In a mixing bowl, whisk together the lemon juice, extra virgin olive oil, garlic and jalapeno. 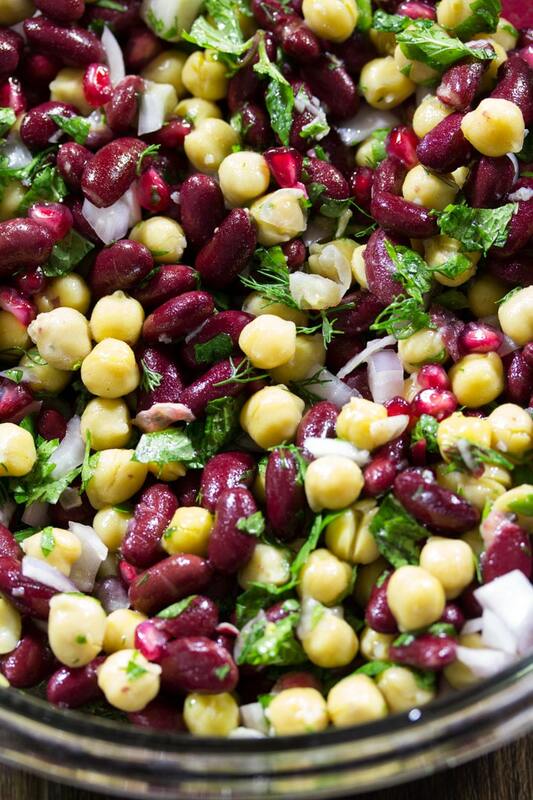 Add the chickpeas and red kidney beans, and mix until fully combined. Now add the herbs: parsley, mint, and dill. Add pomegranate and red onion. I LOVE all of the protein in this! Will definitely keep you full! A lot of flavors in this salad! Yum! I love the little bit of spice and the pop from the pomegranate here! Need to make this salad- It looks so good!